”The Lars Homestead is the fictional home of Luke Skywalker in the Star Wars Saga. The actual structure is sitting in the Tunisian desert, near Nefta. The original dome is long gone (Star Wars was shot there in 1976), but for the Prequels, they rebuilt the homestead in the exact same spot at the turn of the 21st century. That building had suffered badly from the climate and in 2012, six fans from around the world, led by Mark Dermul, took it upon themselves to restore it to its full movie glory”. Now to the whisky itself which is from single bourbon hogshead no. 4905. The hogshead gave 100 bottles so it’s very limited (and now seems to be sold out). It was distilled in 1989 and bottled in 2013. A big thanks to Mark ’The Toshan Man’ Dermul for sending me a sample! I have not tried that many Auchentoshans so this will be exciting! Almost nothing of the citrusy things from the nose comes through on the palate, perhaps some touches of very soft lemon curd. More evident is the big vanilla and the cream and there is LOTS of it! Mmm… Actually I’d say that the eggnogg is there too and interestingly enough some coffee flavours, cool. There is also marzipan and a little warm zing from the alcohol comes through but in a very gentle manner. This is very savoury and more-ish, warming and with thick, fat flavours. Mark and Manny, you sure picked a great cask of Auchentoshan so Slainthé and a Merry Christmas to you and all my readers! Tasting two absolutely new bottlings from ’Svenska Eldvatten’! 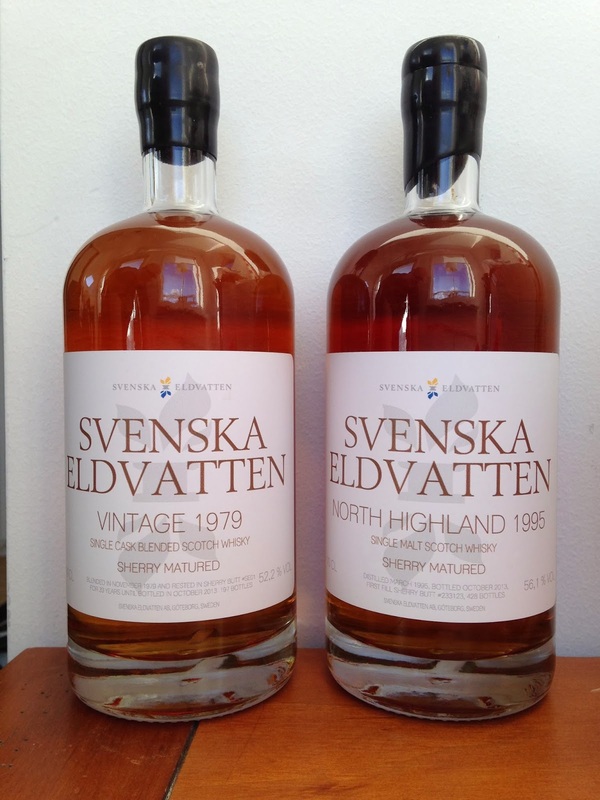 During the Örebro Beer & Whisky festival this weekend I had the great privilege to receive samples of two coming bottlings from the swedish independent bottler ’Svenska Eldvatten’ (’Swedish Firewaters’)! A big thanks to Peter and Tommy for that! The two whiskys were meant to be released today at the swedish state monopoly liquor store but fans shall have to wait for a few days (around the 10th december). I am very happy to be the first blogger to taste these two! Ok, this is very exciting for me so hang on, here we go! The first thing I get is a very citric or acidulous touch, interesting! Elderflowers, summer apples, fresh rhubarb, so very excotic, even dried banana (kind of like nature candy). Lemonpeel and also something like ”pear soft drinks”, very fruity. Below that layer is soft vanilla, almost creamy, lemon curd and marzipan, but the main things on the palate is the excotic/fruity touches. I think it’s very interesting that the first things that come to mind are scents that I associate with bourbonwood matured whisky (not in a bad way of course), which is a bit strange since it’s sherry matured, well, my nose must be wacky after the Örebro Beer & Whisky festival… When I come to think of it there is quite a lot of dried raisins but rather sultanas than dark raisins. Hmm, exciting! Time to see what’s on the palate! Absolutely gorgeous, and strong! Starts of like the nose on the citric or acidulous side of things, but kind of in combination with a quite fast journey or flow into the vanilla, the marzipan, then dried figs, and actually dried dates, the sticky and a little bit dry inside of the dates. Not the bitterness of grape seeds (red grapes) when you bite one, but a little bit like the dryness of them, and of the white in the banana peel, once again of course in a good way. I’d say that there is more sherry influence on the palate than on the nose. 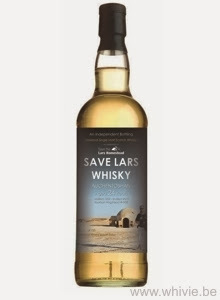 This is a very interesting whisky and I’ve never had anything quite like it, wonderful! For the folks living in Sweden, don’t miss out on these two beauties. The bottlings from ’Swedish Firewaters’ that I’ve tasted so far have been very good, but these two are just grand!